Color Pallette… Color Blindness… When is a something done? I have mentioned color pallette in a few postings already, but don’t think I’ve gone in to a lot of detail about my personal preferences in my own color uses, why I have those preferences, etc. so I figured it might be time to post a little bit about that here, even though most of the stuff that I’m uploading to the artfolio is not color yet – It’s mainly black and white or blue and white sketchbook scans for now, but I’ll get around to uploading the color works later, and at that time, it’ll be good to know a little about my use of color. For those of you that don’t know this yet, I am partially color blind. Greens and Reds that are medium toned or darker tend to look alike to me, which appears to be the same color as a grey color (just black and white) tone of the same value. Luckily, I’m not fully color blind, or else this little issue would have a much more major impact on my artwork than it does now. Bright reds, and greens are very visible to me. It’s only the darker tones that are usually seen in shadows that make things a bit difficult for me. Because of this, I have a tendency to drive myself towards pointillism type of styles, or similar types of styles that use visual color mixing instead of real color mixing, at least in this part of the color spectrum. That way, I can move in very close to the canvas, and look at what is going on with the color blobs up close and personal to try to resolve issues and create a plan of attack to figure out what move to make next in this chess game of creating art. Eye strain headaches does come to me after a while of doing this sort of stuff, especially since I’m near sighted… because I’m constantly looking at different areas of the painting, or color drawings at a distance, and then up close, and then at a distance, and maybe upside down to check composition, etc. I did not even realize I needed glasses for my near-sightedness until after I graduated from college, but I really should have probably gotten glasses a very long time before that. My dad loves transitions lenses and got me hooked on using them since they keep me from having to constantly buy sunglasses only to lose them. However, the transition lenses do cause me problems when making art and viewing art sometimes since they put a dark tone on everything I see through them. Because of that, I have to take off my glasses to view things in museums, galleries, or as I paint sometimes so that I’m not making major color/tonal mistakes. That causes even more eye strain on occassion. I do like the transition lenses since my eyes are pretty sensitive to light, and they make staring at a computer all day at my 40 hour a week job more tolerable. However, I hate that they cause me to not be able to see a lot of true colors at a distance… All through school, I remember squinting a lot in painting classes and drawing classes. I just assumed that this was normal at the time since I had never thought to check with a vision specialist. I knew that I was color blind, and just sort of assumed that the squinting and headaches were a normal part of the process of creating art. I sometimes wonder how things would have been different if I had glasses way back in elementatry school…. Strangely, all of this does not have a huge impact on viewers of my work because a lot of artists use green to muddy down red and vice versa to get shadow colors and tones as they are on opposite ends of the color spectrum. My favorite colors are somewhat bright and intense. As mentioned in another post, I love the color pallette that folks like Remington use, where there’s lots of vividness to the work and it sort of brings a positive cheery mood in to play. I like mixing colors on the canvas itself visually more than a lot of other painters do. I do mix colors when I can but like using paint staight out of the bottle when possible so that it’s easier to come back to an area and re-work it or balance it out with similar colors on opposite ends of the canvas if I need to… Stuff that comes out of a bottle is usually mixed fairly closely to other stuff that comes out of a bottle that has the same label and is made by the same company. That makes it easier to not have a lot of worries about painting an area and then needing more of that same paint mix later, but not being able to find it because you cannot figure out the exact proportions of which paint you mixed to arrive at that color, especially when, like me, you are color blind so physicially mixing the paint is a very difficult chore. That label on the bottles of paint helps ease my mind in making decisions since I know that the green in that bottle is the same green that I got out of that bottle an hour ago. Pointillism type effects can be used to help mix and match just about any color that exists, at least at a certain distance. My favorite oil paint colors are usually Cadmium Red (for bright bold red intensity), Crimson Red (for darker red tones and colors), Currealean Blue (for highlights that are in blue – lots of artists are afraid to use blue in highlights, which is a huge loss to their works), Cobalt Blue (for mid-intensity blues), Prussian Blue (for really deep dark blues), and occassionally a very bright yellow, and maybe something strange like violet, which can be very bright and noticible if applied thickly or almost unnoticible if applied thinly with the rest of the colors mentioned above, either scumbled on or put in to small dabs in small pointillism type fields of color on the canvas. I also use just about any other color out there that I can on occassion in small bits, but the colors listed above are the main ones that I usually end up utilizing the most. Most of my works usually end up heading toward red/blue side of the color spectrum because of that. There’s just something about Purple/Violet combinations or near-purple violet that is reached by visual color mixing that I really love – it’s a deep passionate, and dramatic color scheme. A simple line drawing done in 30 seconds or less can be thought of as a final work of beautiful art just as a photo-realistic painting that took thousands of hours to create can… Any and Everything in between these two extremes is where most artist live. It’s a very dangerous rocky terrain with a lot of smooth valleys full of beautiful smelling flowers. It takes a true artist to know how to balance it all out and make sure that the level of realism is right for the work in question, and each individual area of each work’s composition in question. There’s a different answer for each artists and each individual work. As I post more artworks in to this blog, I’ll try to explain my own individual tendencies, techniques, and ways of doing things to get my works to where I want them. It is often said that an artist is his/her own most critical judge. I agree with that somewhat. However, that judgement is what makes us who we are, and makes us strive to do better in the future, or to strive to make horrible and hideously disgusting works that cause fear in the hearts of mankind…. It’s all about figuring things out and making them work… knowing the messages you are trying to communicate and trying to find ways to make those messages clear. For me compositional balance is a very important thing. For others, maybe not so much. I’ll try to post more artwork here in the blog later this week. I have always been a fan of Kiefer’s works. The first work that I ever saw of his is located in the St. Louis Museum of Art, Breaking of the Vessels. Kiefer’s work is gigantic, and epic, but also sublime and simple. It questions history, and our place in it. It takes Germanic Expressionism to a whole new level. It brings the painting/sculptures to the people, quite literally… It calls to mind the supernatural and makes us think about why it is, what our relationship is with it. It makes us question our reality and opens our minds to thinking about things more. I could write tons about the psychology behind Kiefer’s works, but think many great authors have already done so over and over, so I’ll leave you to explore their ideas on your own time. Kiefer’s works are something that you need to experience in person. The hugeness of the works, and strange physicality to the works is something that digital photos and art books do absolutely no justice to. Anselm Kiefer is a master of mixing physical things in to his paint and integrating sculpture in to his painterly works. Frank Stella is the only artist I know of that has works that combine 2d and 3d elements in such strange combinations that they start to come close to the mastery that Kiefer has over this realm. However, Stella’s works are typically pretty happy colors from the pretty happy rainbows that the pop world embraces while Kiefer’s is made of the mud-like dreary colors that are true dramatic tragedies that explore the psychological world a heck of a lot more in-depth than Stella’s simple facades ever can. 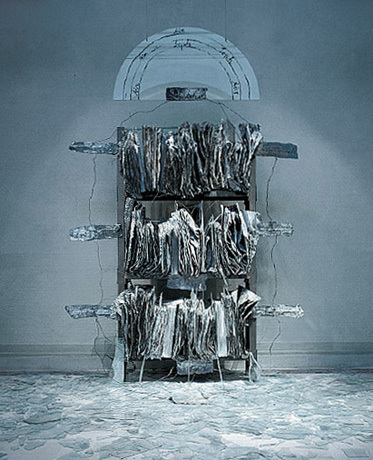 I’d love to do artwork the size of Anselm Kiefer’s most popular works, but don’t because the sheer enormity of such works make storage a gigantic problem unless the works are going directly in to museums and galleries. Taking photos of the works is also problematic because of the huge size. A photo just does not do these sort of works any justice since there is so much more to the works than a simple photo can capture.